Oct 25, 2018 (LBO) – East terminal of Sri Lanka’s busiest Colombo port will not be given to any other country as it is being developed by the Sri Lanka Ports Authority, Port Minister Mahinda Samarasinghe reiterated today. In the master plan of Colombo port expansion project, the East Container Terminal (ECT) has a 1200m long Quay wall, alongside water depth of 18m and a yard capacity of 2.4 million TEUs. Sri Lanka Ports Authority has already completed a 440m single berth as the first phase of the ECT development plan to cater the shortfall in the capacity of container handling in the port of Colombo. This consists of 440m quay wall alongside water depth of 18m and successfully completed in May 2015 with a project cost of 80 million US dollars. “President informed us two weeks ago at the cabinet meeting that he told Indian Prime Minister at the sidelines of BIMSTEC that we can’t give East Terminal to anyone because SLPA has plans,” Samarasinghe said. Samarasinghe, however, said that Sri Lanka is ready to give Colombo Port’s proposed West Terminal to India under an MOU signed between the two countries earlier. 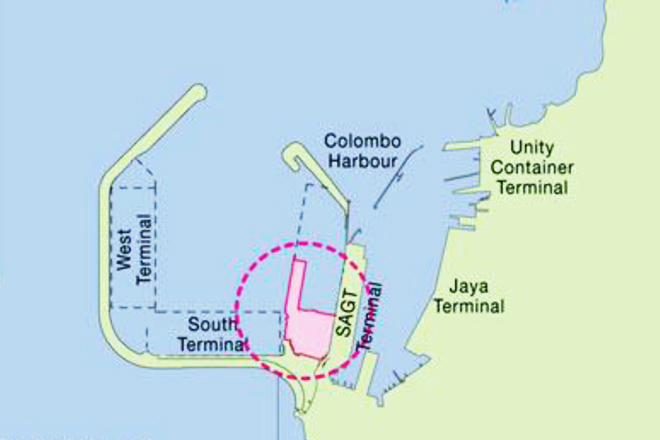 “West Terminal has not yet developed, so there is only a breakwater; no jetty. Whoever gets it has to make a big investment,” Samarasinghe said addressing a press conference. According to media reports, the President and Prime Minister have involved in a heated debate over this issue at a recent cabinet meeting that ended up Wickremesinghe meeting Indian Prime Minister.